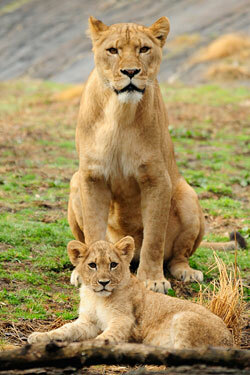 Over 6,000 animals and fun family attractions make the Bronx Zoo a must see that your whole family will enjoy! My kids and I visited the Bronx Zoo for the first time over Memorial Day last spring. Having never been there we were all so impressed by the enormity of the zoo and all of the incredible animals and attractions. We ended up spending eight hours there on that day and I'm pretty sure we could have spent another eight more and there would still be more to see. One of my favorite things to do after my kids and I visit a new place is to ask them each to list their top 5 favorite things about the experience that they had. I love to hear their perspective on what they saw and did because it can often differ from what I may have perceived to be their favorite. It also helps me to identify where they are developmentally and what kind of trips to plan for them next. Here are their top ten favorite things in no particular order about their day at The Bronx Zoo. I hope you and your kids enjoy! Dinosaur Safari – Travel back in time to the age of the dinosaurs on this safari attraction. This is about a ten minute ride through the woods where life like dinosaurs will greet you along the journey. Be sure to keep your arms and legs in the vehicle because The giant T-Rex is hungry! !Your budding paleontologist will not only get to see some of his favorite dinosaurs up close but at the end there is a fossil dig that they can participate in, a shop with all things Dinosaur and they will get their very own Dinosaur Field Guide. Wild Asia Monorail – Running from May to October this ride lasts about 20 minutes. You will pass over the bronx river and head into the land where tigers, elephants and rhinos room. It is very relaxing and there are lots of amazing animals to see. Seal lion Pool – A beautiful historical part of the park where you can take a rest from all of the busyness. The kids will love to sit and watch the Sea Lions swim and each day at 11:00 am (except Wednesdays) and 3:00 pm they can watch the Sea Lions get fed. Giraffes – This was my daughters absolute favorite animal in the Zoo. The Giraffes are so incredibly beautiful and tall! Quite a site to see. Bug Carousel – Take a ride on your favorite bug! Grasshoppers, Lady bugs and praying Mantis to name a few. The colors on this ride are spectacular and the kids had a lot of fun choosing their favorite bugs! Dippin Dots – The kids enjoyed their very first Dippin Dots Ice Cream. For those of you, like myself, who have never heard of Dipin Dots, it is an ice cream snack created by flash freezing ice cream and mixing it in liquid nitrogen. It is quite an odd tactile experience. Personally I will stick with old fashioned Ice Cream! Gorilla Congo Forest – Incredible to see these Gorillas up so close! Watch as they eat, climb and play with one another and if you are lucky perhaps one will wave to you! Came Ride – Located in the Wild Asia Plaza. Your kids have a chance to hop on a real camel for a ride around the ring. They have step ups to make it easy for the kids to get on and off. Quite an experience if a trip to Morocco is out of the question. Special Needs Tip: They do a great job focusing on accessibility. Be sure to visit the Guest Relations Building upon arrival for access passes and any other accommodations your family might need.